I always feel a little pity for people who don’t eat seafood. But then my selfish side takes over and I think, “Good–more for me.” My latest passion for crab has been fueled by two spots on the Westside that are doing two completely different preparations on the crustacean. 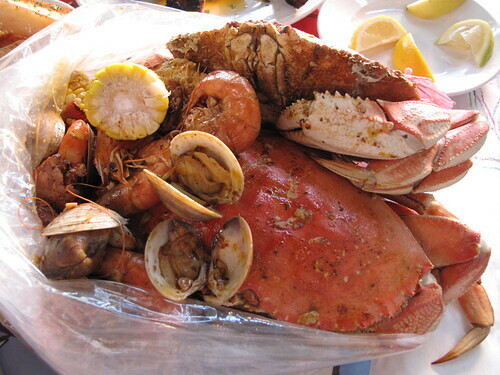 Of course, it helps that Dungeness and snow crab are not mercury-saturated or over-fished. 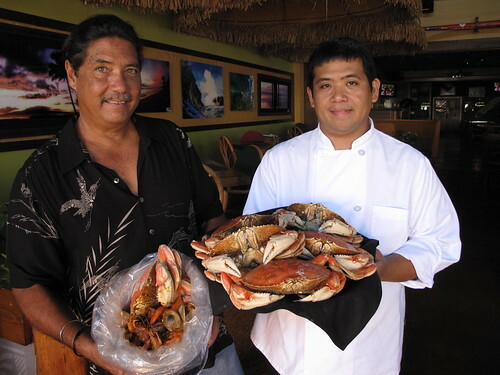 LuLu’s Lahaina started doing a seafood and crab fest back in June–one where you dig in and get your hands dirty. They call it LuLu’s Crab Shack. Over at the Westin Kaanapali Ocean Villas’ Ocean Pool Bar and Grill, the all-you-can-eat crab fest happens on Wednesday nights, allowing you to crack crab legs to your heart’s content. Dungeness crab hail from the Pacific Northwest, but San Francisco’s Fisherman’s Wharf made them famous. I love wandering around the Wharf watching the open markets sling crab, crab po’boys on sourdough and fresh Dungeness legs. Ron Panzo at LuLu’s has a hook-up with the crab fisheries of San Francisco for his Crab Shack. Panzo adds a Cajun twist to the crab by seasoning the crab in a flavorful sauce. It’s refreshing to see something more creative than drawn butter. I brought my niece, a professional crab leg eater, and we ordered the Punalu’u Bambucha Bucket. That’s two and a half pounds of steamed Dungeness crab, deep ocean prawns, Manila clams, linguica (LuLu’s gourmet Maui-made Portuguese sausage), grilled corn on the cob and garlic bread. Ordering from the Crab Shack menu means your table gets covered in thick butcher paper, which ends up becoming your plate. We doodled with crayons while we waited (I also sipped a LuLu’s signature Mai Tai, which was served in a pineapple with Bacardi Oakheart spiced rum and topped with pineapple sea foam). When the bucket arrived, Panzo showed us that the best way to eat it is to dump the contents onto the table, then grab our crab cracking utensils and go. There is some dirty work, but it’s like finding treasure once you expose tender bits of crab flesh. There are no forks or plates–it’s your hands, the table and no shame. Revel in the primal eating event. My niece definitely got the award for eating the most crab. What I loved is that they steamed the crab whole–no half backing or chopping. I’ve never seen the carapace of a whole Dungeness, and was delighted to find that they’re gloriously full of crab meat. I concentrated on one giant crab, pulling sweet lumps of steamed crab meat from beneath the underbelly shell, while my niece took down leg after leg. In between bites, we shelled prawns and dug meat from clams, then supped it all up with garlic bread dunked in the sauce. The special recipe sauce can be messy, but the flavors are unique and part of the experience. LuLu’s Crab Shack menu also offered some fall-off-the-bone pork ribs, which you can add to your orders with crab, prawns and clams sold by weight. Sides like fries, rings, cole slaw and baked potato complete the Cajun and southern influence, but Panzo said the special sauce recipe is actually from Uncle on the Big Island. LuLu’s has huge menu for big appetites, and we couldn’t leave without satisfying a sweet tooth. They offer fun desserts like Charlie Brown’s Waffle Hula Sunday, Bananas Foster and haupia cream malasadas. 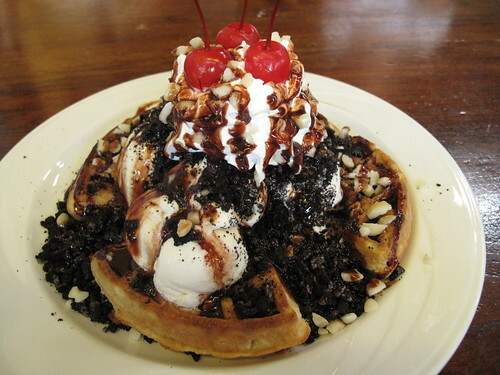 The toasted waffle with a huge stack of scooped ice cream, caramel and chocolate sauce and is topped with Oreo cookie crumbs and mac nuts. It was one of the best sundaes we’ve indulged in. For those looking for more a crab meal that includes plates, the Westin’s Ocean Pool Bar and Grill Crab Fest Wednesday nights are plush. 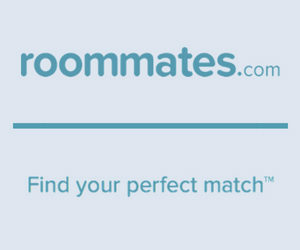 They’ve got a buffet style set-up with perfectly steamed crab legs and plenty of fix-ins. Start with some of their mixology–the Raspberry Smash is a surprisingly divine muddle of Dewars and fresh berries. The beautiful poolside sunsets visible from their al fresco dining room aren’t bad either. At the buffet, I couldn’t get over their great warm butter spigot. A stack of ramekins are at the ready to catch however much butter you need. The butter resides in a professional coffee urn held at the perfect melt, and is poured with the flick of a finger. But all that butter would be nothing without those legs. 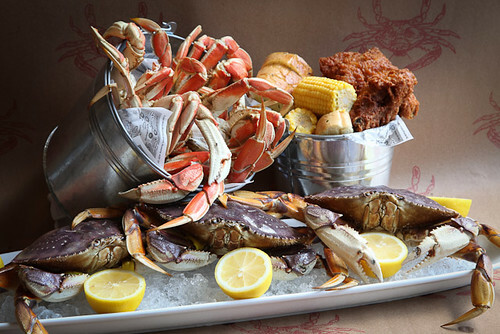 They serves snow crab from chilly Alaskan waters–the kind that you see getting caught on Discovery Channel’s Deadliest Catch–and Dungeness crab legs. They are steamed and served in chafing dishes at the buffet, which also offers fried chicken, potato salad and Maui corn. There’s green salad and savory garlic bread, too. Sous Chef Alvin Savella teams up with Executive Chef Francois Milliet for the concepts at Ocean Pool Bar that also include an Upcountry barbecue night and a prime rib night. They have live music Fridays and Saturdays and happy hour 3-5pm daily. Savella loves to incorporate pineapple into his menus, and it’s a highlight on the dessert menu for Crab Fest, too. Playing tourist is also easy at the Villas because they welcome residents with free and easy guest parking. Just park next to the South Tower and head in through the lobby; the Ocean Pool Bar will be to your left. Keep in mind though that reservations are required: call 808-667-3254 for more info.